Lend Mother Nature a Hand – Mother Nature has her ways of naturally fertilizing your lawn’s soil. 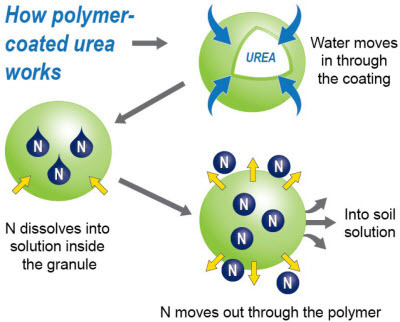 For example, did you know that during lightning storms, nitrogen atoms are released which are then absorbed by the rain, and when the rain hits your lawn, the nitrogen goes into the soil and your lawn is fertilized? There are at least 17 essential nutrients required for plant growth. Plants get these nutrients from the air, soil and water. 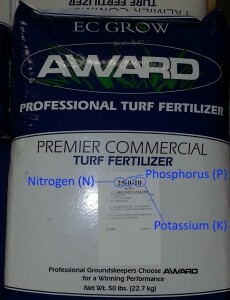 On bags of store-bought Fertilizer, you always see 3 Numbers that represent the N-P-K Rating. If you want to learn more about these N-P-K numbers, check out this Wikipedia article. Basically, each number is the percentage of N-P-K in the fertilizer. 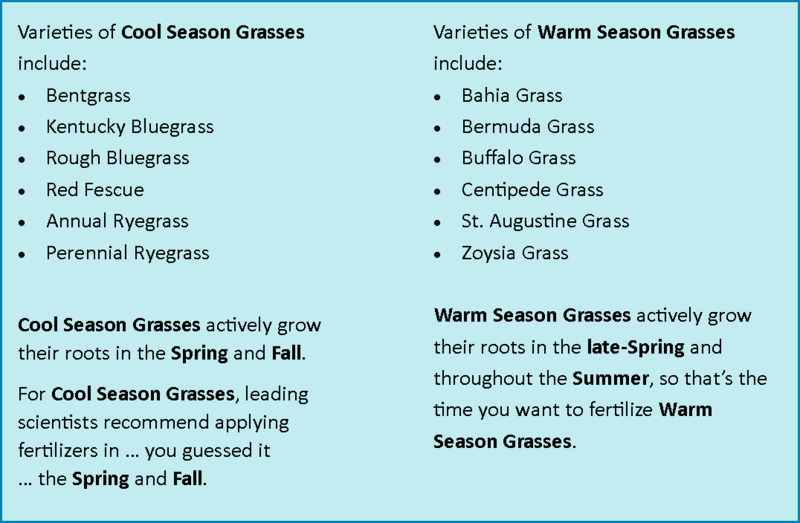 There are a multitude of grass varieties, but did you know that they basically fit into 2 categories of grass types … Cool Season type Grasses and Warm Season type Grasses? Each grass type is better suited for either warmer or cooler climates, and is sensitive to factors like air temperature, soil temperature, moisture, and soil type. Q: What type of Grasses are best suited for the climate here in Indiana? A: If you guessed Cool Season Grasses, you are CORRECT. Again, grass (like any plant) needs Nitrogen and other essential nutrients, especially during times of active root growth. If you fertilize your grass when it’s naturally dormant, you’re wasting fertilizer (and money!) The healthier and more vigorous your lawn is, the better it can hold up to stress from heat, drought, traffic, and pets. Grasses also grow best with a REGULARLY SUPPLIED application of nitrogen and other nutrients, so if you space your fertilizer applications too far apart, then your grass will grow fine for a while, then slow way down, and then speed up again with the next application. An irregular supply of fertilizer leads to uneven growth spurts and actually puts stress on your grass, giving it little competitive ability against weeds and disease. Lawn Fertilizer Companies stand to make a lot of money from prescribing 4-Step and 5-Step fertilizer programs that do NOT take into account YOUR GOALS for how “perfect” you want your lawn to look or the UNIQUE NUTRITIONAL NEEDS of your lawn. Q: Since every lawn has its own unique history of maintenance, use, and abuse, HOW can you possibly know what nutrients your lawn’s soil is lacking (or has too much of)? A: Have your soil tested by a certified lab. At Red Hen Turf Farm, we recommend that you do a soil test for every 10,000 sq. ft. of lawn, every 3 years. We regularly use A&L Great Lakes Laboratories for our farm fields’ soil testing, and feel confident about recommending them to our customers. The current cost is $8.35 per each soil sample, plus the cost of shipping the soil test bags to the lab. If you use our Soil Testing Procedures (available by CLICKING HERE), the results are sent to us and we will translate them into layman’s terms and work with you to make recommendations for fertilizing your lawn based on its particular nutritional needs. So, WHAT are your GOALS for your Lawn this year? Generally, the more pristine you want your lawn to look, the more “steps” or applications of fertilizer you’ll need plan on doing. First, it is important to know that if you apply too much Nitrogen at once, you will probably end up burning your grass. To avoid the chemical burn from too much Nitrogen, you’ll want to apply no more than 1 pound of nitrogen per 1,000 square feet with each application. Also (and please read this sentence ONE MORE TIME): It is very important to read the label on the fertilizer bag. Fertilize your lawn once every 6-8 weeks during its active-growth periods. Generally, this means that each year, you’ll want to apply 3 to 4 pounds of Nitrogen (N) per 1,000 square feet of lawn. For regular, even feeding of your lawn, break up the yearly requirement of Nitrogen into the appropriate number of applications … For instance, for Cool Season Grasses plan on 1-2 fertilizer applications in the Spring and 2-3 applications in the Fall. Fertilize once in Spring and once in Fall for Cool Season Grasses and you will still have a pretty nice lawn. A lower-maintenance lawn typically requires 1 to 2 pounds of Nitrogen per 1000 square feet of lawn per year so, again, break up the yearly requirement of Nitrogen between these 2 applications. Fertilize Cool Season Grasses once a year in the Fall, but remember to apply no more than 1 pound of nitrogen per 1,000 square feet. Whichever way you go, here are some tips from Purdue Extension for how to apply your fertilizer, although here at Red Hen Turf Farm, we recommend using a high-quality, properly calibrated Broadcast Spreader (aka Rotary Spreader) rather than hand-held Drop Spreaders (aka Gravity Spreaders) because Drop Spreaders generally take a lot more time to use, and they tend to give you a more consistent spread pattern. So, here we are. It’s northwestern Indiana in mid-June, and for the majority of homes have Cool Season Grasses to tend to, and you still have time to nourish your lawn with your second (or even your first) late-Spring round of fertilizer. If you’d prefer a more organic approach, our 5-2-4 Suståne Natural Fertilizer might be the way to go. Not sure where to start? Having issues with your lawn that you’re not sure how to deal with? Are you ready to take a more informed approach to your lawn care? Contact Red Hen Turf Farm at 574-232-6811, and we’ll be happy to chat with you. Our current hours are Monday – Friday 7:30 AM – 4:00 PM EST, and Saturday from 7:30 AM – 11:30 AM EST. The Window for a Fall Grass Seed Planting Will Be Here and Gone Before You Know It! This entry was posted in #RedHenSpringFever, Fertilizer by admin. Bookmark the permalink. 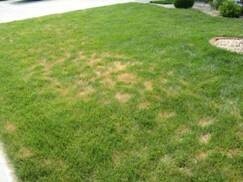 That’s really fascinating that lightning storms can be good for your lawn since it spread nitrogen through the rain. Obviously, that’s only when the lightning doesn’t hit your own yard. I’ll have to pay more attention to the kind of fertilizer that I use on my lawn so that it gets the right nutrients. If that stuff is that important to having a nice lawn, I’ll keep an eye on it. It’s really interesting that different kinds of grass should be fertilized at different times of the year. It’s good to know that it’s about time to take care of this, though. I’ll have to look up fertilizer that has a mix of quick and slow-release nitrogen. I want my lawn to be healthy after all.